. ::/ The Box Children :: Sharon Wyse \::. "Wry and heartfelt, this is a quietly impressive debut. Bottom Line: Open this Box." "A trenchant debut novel that is equal parts heartache and hope." "Wyse's almanac of a farm summer is an affecting mid-century 'Works and Days,' a pastoral ode in which the annual harvest, for one Texas girl, reaps much more than wheat." "We applaud Wyse, who has created a quietly lovely gem in The Box Children." "Using the innocent language of a child's diary, Wyse effectively conveys a tale of horror. Lou Ann... survives by denying the oppression and continuing to dream of her part in the bigger world... This powerful story of adaptation and survival is recommended for all fiction collections." "This emotionally complex story entertains, frustrates and tugs at the heart-strings... Wyse captures the voice of her young protagonist with remarkable skill and naturalness, from her innocent fantasies to her bleakest moments." Eleven-year-old Lou Ann Campbell starts a diary on scraps of paper that she hides from her mother in a barrel behind the bunkhouse on her family's Texas wheat farm. Lou Ann's mother has had five miscarriages and Lou Ann has created the box children--five plastic dolls who live in a shoe box--to memorialize these "ghost babies." The Box Children is Lou Ann's secret diary. Through her spare, sure voice, we share Lou Ann's experiences over the course of one extraordinary summer. The Box Children is also a record of Lou Ann's relationships--with her unstable and cruel mother, who intrudes into every aspect of Lou Ann's life; her adulterous father, whose relative sweetness compels Lou Ann to excuse serious excesses in behavior; her older brother, who rejects her as he struggles with what it means to "be a man"; and with the box children, who become her only companions. 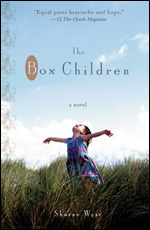 Charming, jolting, and haunting, The Box Children chronicles Lou Ann's unflinching search for a connection to the wide world outside her farm. Ask your local bookseller for The Box Children today!